COMMENTS A new FTD double-soundboard release FROM GEORGIA TO FLORIDA 1975 has been announced featuring two concerts from April 1975. Released as a 5" digipack, a 2CD set features Elvis in great form from his shows at the Coliseum in Macon on April 24, 1975 and previously unreleased Lakeland April 27, 1975 Afternoon Show. The set-list is fine including Big Boss Man, It's Midnight, Promised Land, Burning Love, Help Me, My Boy, T-R-O-U-B-L-E and I'll Remember You.. COMMENTS NOTE: ONLY ONE COPY LEFT!! This is the ultimate FUN IN ACAPULCO 3-CD set: includes more than an hour of previously unreleased false starts, break downs, and complete takes! All tracks have been recently remixed and mastered from the original 3-track session tapes. The 8" x 8" slipcase replicates RCA Victor,\'s vault-stored session reel box. The 28-page booklet includes rare photographs, memorabilia, session data, Movie Trivia and an updated overview of the movie by Alan Hanson. The 3-CDs are housed in a CD carrier adorned by original tape box documentation. COMMENTS FTD announced the release of Elvis: St. Paul to Wichita - October ,\'74, released as a 5" digipack, and taken from the original soundboard source, this 2-CD set features Elvis in excellent form from the fall tour of 1974. Elvis was in great form and using a variety of repertoire. CIVIC CENTER, ST. PAUL, MINNESOTA. OCTOBER 2, 1974. HENRY LEVITT ARENA, WICHITA STATE UNIVERSITY, WICHITA, KANSAS. OCTOBER 7, 1974. COMMENTS At last! The classic FOR LP FANS ONLY album Finally gets the full FTD Classic Album upgrade! 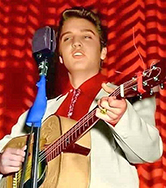 This legendary album released in 1959 while Elvis was serving his time for the US Army in Germany, now features bonus tracks including RADIO and TV performances from the 1950s and the quality highlights from the recently discovered Bad Nauheim German home recordings. Great performances from the Milton Berle Show, Stage Show and the Steve Allen Show are complemented by intimate recordings of Are You Lonesome Tonight, His Hand In Mine and He Knows What I Need. Released in 7 inch gatefold format it also contains a 16-page booklet. FOR LP FANS ONLY was nominated for best album art of 1959. Please click on the photo for a larger photo of this CD package. COMMENTS The FTD label is pleased to announce the release of this CD. Released as a 5 inch digipack, this 2-CD set features Elvis in great form from the Hilton Holiday Season shows in December 1975 Las Vegas. The shows are soundboard quality and the audio has sonic imperfections. It is on the original source tape.